The Cherokee Nation of Oklahoma owns and operates eight casinos. 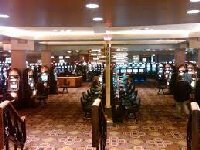 Cherokee Nation Entertainment is the retail, gaming, entertainment and hospitality division of the Cherokee Nation. CNE gives 30 percent of its net profits to the Cherokee Nation in the form of a dividend. The money is used to help fund tribal health, education, community services and housing.